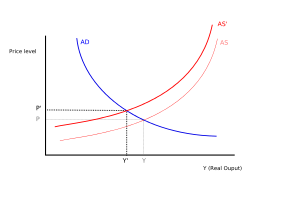 Cost-push inflation is an alleged type of inflation caused by substantial increases in the cost of important goods or services where no suitable alternative is available. A situation that has been often cited of this was the oil crisis of the 1970s, which some economists see as a major cause of the inflation experienced in the Western world in that decade. It is argued that this inflation resulted from increases in the cost of petroleum imposed by the member states of OPEC. Since petroleum is so important to industrialized economies, a large increase in its price can lead to the increase in the price of most products, raising the inflation rate. This can raise the normal or built-in inflation rate, reflecting adaptive expectations and the price/wage spiral, so that a supply shock can have persistent effects. Keynesians argue that in a modern industrial economy, many prices are sticky downward or downward inflexible, so that instead of prices for non-oil-related goods falling in this story, a supply shock would cause a recession, i.e., rising unemployment and falling gross domestic product. It is the costs of such a recession that likely causes governments and central banks to allow a supply shock to result in inflation. They also note that though there was no deflation in the 1980s, there was a definite fall in the inflation rate during this period. Actual deflation was prevented because supply shocks are not the only cause of inflation; in terms of the modern triangle model of inflation, supply-driven deflation was counteracted by demand-pull inflation and built-in inflation resulting from adaptive expectations and the price/wage spiral.